We weren’t disappointed. The next morning, we drove into the town of San Jose for breakfast at Passion. There are actually six branches of passion spread across different locations on the island, with San Jose being their newest venture. It was fairly empty upon arrival, which meant we had free reign to explore the restaurant before deciding where to sit. Painted in mediterranean inspired white and turquoise tones, the large interior is filled with oak wood tables and benches, splashes of terracotta, floral wall murals and gorgeous large windows flooding the rooms with sunshine and light. Not to mention the plethora of inspiring quotes and paintings dotted along the walls. One side of the cafe overlooks a majestic backdrop of lush green hills, whilst the other looks over the pretty village of San Jose. Inside, the large expanse is airy, peaceful and welcoming; the perfect space to relax over a long, leisurely breakfast. And that we did. After an initial agonising 10 minutes spent perusing page after page of incredible sounding breakfast options, we finally made our decisions- the Passion Porridge made with chia, oats, medjool dates, coconut cream, poached pears and maple syrup, the toasted coconut bread with coconut butter, a rose water latte and superfood mocha. All in all, a very cheeky little feast. Now, I’ve eaten a lot of porridge in my time, but oh sweet lord- the passion porridge is one to write home about. It is truly one of the most glorious breakfasts I have ever eaten. The combination of flavours was absolutely perfect; I think my smile grew wider with every bite and I must have joyfully exclaimed ‘I can’t believe it!’ at least 5 times. Andrew’s toasted coconut bread was equally mouthwatering. Lightly toasted and smothered in a layer of rich, silky coconut butter, it was a tropical treat. As for the rose water almond latte- I don’t usually take any sugar in my coffee but I think it could have done with a teeny bit of sweetness as the rose water added a slightly bitter edge. Andrew’s superfood mocha was incredible- chocolatey, creamy… and healthy to boot! What if I told you we revisited Passion twice more during our 72 hour stay in Ibiza? Time for a quick story- one that will immediately be deemed a ‘Molly moment’ by anyone who knows me well. The morning that Andrew and I set off for Passion, we woke up feeling really hungry so decided to go out for breakfast first before coming back to the apartment to shower and get ready for the day. But, after our delicious breakfast, we were feeling extremely full so decided to walk it off around the pretty village of San Jose. We set off along a little trail of gorgeous Spanish fincas, and before we knew it… we were on a hiking trail. It was so beautiful that we decided to follow along it for a few more minutes before turning around. …We didn’t turn around. Four hours later, we were deep into the trail, had no water or suncream, and were extremely lost. Things were not looking good- all we could think about was getting back to San Jose, and back to Passion for some food that would be guaranteed to cheer us up. Finally -and luckily- we found our way back to the village, and made it into Passion just in time for the end of their lunch service. Andrew got the chicken in a parmesan and olive crumb with sweet potato mash and a tomato and olive oil salad, whilst I opted for the salmon burger in a black bun with seasoned sweet potato fries. They were both just as delicious, well seasoned and beautifully presented as our breakfasts had been. We were so hungry that I forgot to take photo’s! …So we went back for breakfast the next morning. This time, Borja, our lovely waiter from the previous day, welcomed us warmly into the cafe. The staff at Passion definitely know how to help you have the best experience at their cafe- you are immediately made to feel comfortable and welcome- and they are more than happy to suggest their top picks from the menu. Andrew chose the antipasti breakfast board containing tuna steak, manchego cheese, olive bread and fresh tomato salsa. Every component of the board was fresh and delicious, with each ingredient complementing the other perfectly. After much temptation from the numerous selection of pancakes, granolas, parfaits and porridges, I opted for a savoury breakfast- the ‘Green Eggs’ consisting of pesto scrambled eggs with tomato salad, olive bread and a side of turkey bacon. It tasted INCREDIBLE- the eggs were perfect in texture and seasoning, the salad was light and flavourful, and the turkey bacon took an otherwise 10/10 breakfast through the roof. There are pretty much no words to describe the flavours I experienced with that breakfast. It was one of a kind. The turmeric latte I had on the side was the perfect pick me up- almond milk, coconut oil and medjool dates blended with turmeric and finished with a sprinkling of cinnamon made for a creamy delight. 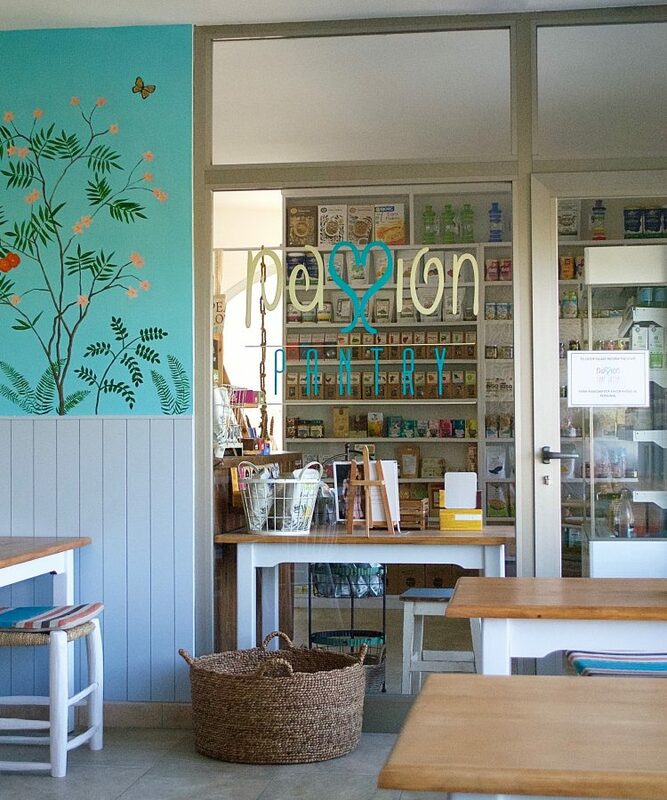 If you’re looking for healthy, interesting dishes in Ibiza, I can’t recommend Passion Cafe enough! Delicious food, fantastic service and beautiful interiors- as Passion themselves put it, their cafe is truly “the home of health and happiness”. Passion San Jose is open Monday-Friday 10am-4pm, Sat-Sunday 10am-5pm. Alternatively, you can find a Passion in numerous locations across the island- check out a full list of locations on their website for more information. PS. Don’t forget to check out my recent guide on where to eat, sleep, workout and shop in Ibiza!